In early September the Government unveiled plans to relax the planning rules for a 3 year period to allow homeowners, property owners and businesses to build larger extensions to their properties without the need for planning permission. For this limited period people will be able to build larger extensions to the rear of their houses - up to 8 metres long for detached homes and 6 metres for others. We believe that this will help get Britain building again, especially in respect of smaller local builders, this is a much needed 'shot in the arm' for the building trade as a whole. Timber cladding is the ideal material to use for the exterior finish of extensions. It is a sustainable, durable, attractive and cost effective material that can enhance the look of any extension giving it a contemporary feel. At Bennetts Timber we are able to supply cedar, larch and thermowood to your specification. 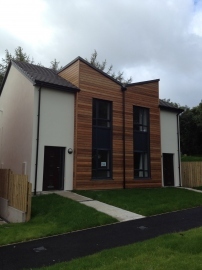 The photo shows the Hampton Farm affordable housing project on the Isle of Man, where the external use of cedar cladding, painted render, grey aluminium window frames and clean lines provide a modern flavour to the estate.